Could Alligators Hold The Secret To Human Tooth Regeneration? AN ALLIGATOR HAS 80+ TEETH that can each be replaced up to 50 times during its life! Potentially, that’s thousands of teeth! 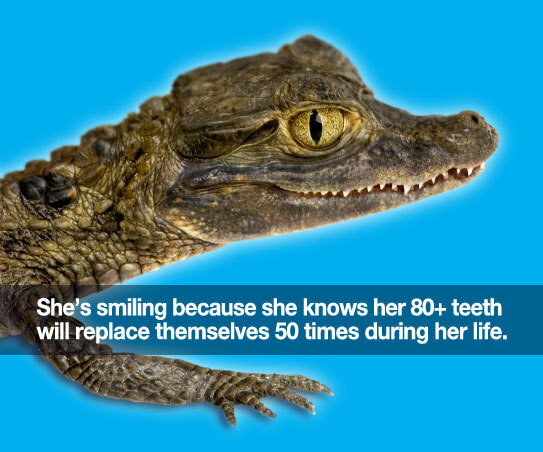 You may be thinking, “Wow, that’s cool… But why are we talking about alligator teeth on this human dental blog?” Well, alligators may be helping scientists learn how to stimulate tooth renewal in humans. Like humans, alligators have well organized teeth, with different functions, fixed in bony sockets. Research shows that there are three parts (or phases) to each alligator tooth—a working tooth, a substitute tooth (ready to replace the working tooth should it be lost), and the dental lamina (a band of tissue that is the apparent hub for new teeth development). Humans are similar, with one big difference. We have adult teeth (these are our “working teeth”) and we have dental lamina. What we don’t have are substitute teeth. While most vertebrates can replace teeth until the day they die, human teeth replace themselves only once. The million dollar question is, why do replacement teeth stop growing after our first adult set? Researchers believe that the dental lamina is the source of tooth regeneration. Stem cells in the lamina stimulate growth. For some reason our lamina turns off when adult teeth arrive. Researchers are working to isolate the exact lamina growth triggers in alligators so that perhaps they can duplicate them in humans. They believe they’ve found a “promising protein compound” but still have a lot of work to do to create the proper elemental combination. The idea of human tooth regeneration is exciting (that’s why we brought it up! ), but it isn’t right around the corner. So, in the meantime, continue taking great care of the teeth you have! Thank you for stopping by our blog! And thanks for being our valued patients and friends. Dr. Theurer and his staff are amazing. They genuinely care about you and your dental needs. I highly recommend adopting all of them for your dental work. Dr. Jared is probably the best dentist I have ever been with. He is so caring and I know he really cares about me and my family and it shows at every visit we make. I highly recommend him to anyone looking for a dentist. You can’t go wrong with him. Oh and they have a beautiful fish tank!!! I generally ”loath dentists”, but look forward to seeing him…I know all of you will have the same positive experience. His Patient caring and knowledge are impeccable. Professionalism is the key to his success…thanks Dr. T.
At this point I consider them family. Always have been treated like a VIP when it comes to professional care and attention to dental needs. Worth the visit every time. I am so HAPPY I found Dr. Theurer! I have struggled with pain at the dentist for years. I thought that was just the way it would always be, not true! Dr. Theurer, His staff, and Trisha, so AWESOME! Thank you, seriously so much for changing my life. I’m truly grateful! Our family has been going to Dr Theurer’s office for about 5 years and we love Dr Theurer and the whole staff. We would recommend them to young and old. Dr. Theurer has taken great care of my teeth as well as my 5 year old’s. She had a cavity he fixed it before she knew it! Need a dentist in Utah? Salt Lake City dentist Dr. Jared Theurer of The Sugar House Dentist provides a unique and comfortable patient experience in all aspects of dentistry including cosmetic dentistry, dental implants, sedation dentistry, family dentistry and much more. He serves patients in Salt Lake City, Utah and surrounding areas including Sugar House, Millcreek, Holladay, Murray and Cottonwood Heights. Dr. Theurer and our entire team take great pride in not only making your dental visit comfortable, but also in providing remarkable value and service. Call us today!